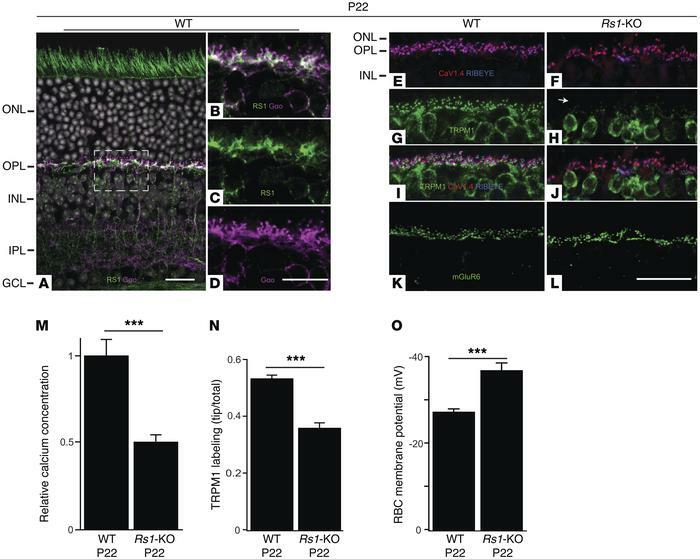 Photoreceptor synaptic calcium deficiency and bipolar TRPM1 channel anomaly and hyperpolarized MP in P22 Rs1-KO retinas. (A–D) RS1 (green); counterstain Gαo (purple), a BC marker. In WT retina, Rs1 is profusely present in the photoreceptor inner segments and OPL. Rs1 is concentrated at the ON-BC dendritic shaft and sparsely present around the cell soma. (E and F) In Rs1-KO retinas at P22, presynaptic RIBEYE (blue) and CaV1.4 (red) are normally distributed as in WT. In contrast to WT retinas (G) where TRPM1 (green) proteins are aggregated at the dendritic tips opposing the presynaptic RIBEYE/CaV1.4 complex (I), the dendritic component of TRPM1 is greatly diminished (H, arrow, and J) in Rs1-KO retinas. (K–L) At P22, mGluR6 (green) is exclusively located at the dendritic tips of the ON-BCs in both WT and Rs1-KO retinas. (M) At P22, measurements with Ca2+-sensitive dye fluo-4 showed that the median [Ca2+]i in Rs1-KO rod spherules was 48% of normalized median WT value (n = 7; ***P < 0.001; Student’s t test). (N) TRPM1 signal intensity at the bipolar dendritic tips was 36% of the whole-cell signal in Rs1-KO retinas, significantly lower than that of over 53% in WT (n = 5; ***P < 0.001; Student’s t test). (O) In line with the TRPM1 defects, the MP of light-exposed RBC is abnormally low in light-exposed Rs1-KO retinas (n = 5; ***P < 0.001; Student’s t test). GCL, ganglion cell layer. Scale bars: 10 μm (B–D); 20 μm (A, E–L). n = 4.